Women who told their stories to the author of a best-selling book on Afghanistan are being persecuted, reports NPR. 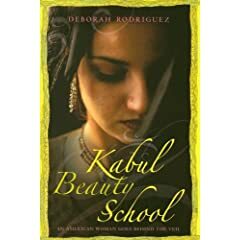 In Kabul Beauty School, Deborah Rodriguez narrates her experiences opening the first beauty school in the Afghan capital, including the personal testimonies of many of the students. In it, Rodriguez describes how she helped one of her students fake her virginity on her wedding night. And she writes of how some of her students were forced into loveless marriages, one of them when she was barely 14. The book is not available in Afghanistan, but somehow people found out about it, nonetheless. And the landlord is threatening to seize the school’s building for non-payment of thousands of dollars in rent. Rodriguez says she plans to give the women who agreed to be quoted a 5% share of the profits from the movie that will be made of the book, as well as some of her royalties. She has also spoken to the US authorities about their position, but the US is not currently granting asylum to people from Afghanistan. But this is a story of a balance of journalistic ethics: Ilyka Damen is far from impressed, criticising Rodriguez’s “exploitative, unconscionable, greed-motivated shenanigans”. Is that the case? Of course, writing about the only beauty school in Kabul means it is hard to protect the identity of the women who studied there. And yet, doesn’t the story still need to be told? I am split on this issue. I wonder if Rodriguez was the wrong person to write this book: as a hairdresser, was she properly trained to deal with the ramifications of publication? Did she fully explain to the women she referred to, that their stories would be made public? It is hard to know: the only certainty is that they are suffering, while she has become a best-selling author.